Irene dos Santos disappeared at age 15. Believed to have drowned while on holiday with her best friend, Lily Martinez, her body was never found. Now, years later, she appears ghostlike in Lily's dreams, prompting a quest for the truth behind her disappearance. Mysteriously, Lily, eight-months pregnant with her first child, slips and falls on the same day that the statue of Maria Lionza, Patron Saint of their Venezuelan town, cracks in two. Confined to her bed, Lily is surrounded by her family and closest friends, who agree that a Novena to Maria Lionza will guide the baby's spirit safely into the world. Together, through their nine nights of prayer, each offers a story to entertain Lily and her baby. What emerges is a vivid picture of Venezuela during a time of revolution and uncertainty-and the unraveling of the mystery behind Irene dos Santos. 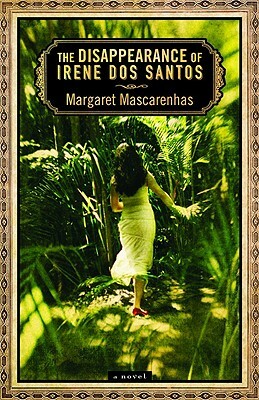 "The Disappearance of Irene Dos Santos is an intricately woven tale of love and memory from a deeply talented writer." Margaret Mascarenhas is a consulting editor, columnist and novelist. She is the author of Skin, published by Penguin India in 2001, also published in French translation by Mercure de France in 2002, and in Portuguese translation by Editora Replicacao in 2006. An American citizen of Goan origin who grew up in Venezuela, she currently resides in Goa, India.